Here in Malibu, summer comes early! Don’t get me wrong, it’s not summer yet… but according to Marc, a gentleman who knows this area like the back of his hand, night time temperature will stabilize around now to a minimum of 50 degree Fahrenheit, which means the first of the summer seeds are being sown. To celebrate, I sowed a bed of red noodle beans. They’re the bling in our garden, their maroon red pods longer than any bean you’ve seen, and delicious raw, straight from the vine and into the mouth. An absolute crowd pleaser come June or July, tender, delicious and a beautiful red. I’ve started to thin the apple tree blossoms. There are four apple trees in all with baby blooms, and a dozen more apple trees that are only just stirring from their dormancy. I’ve pruned all of the trees, the espaliered apples and the regular young trees, looking for a central limb to be my leader and cutting back the other branches to a pleasing wine goblet shape. Then I thinned the blossoms on the four that were ready, and will await the others to present their pretty pink blooms. Once they’re all ready and blossoming I plan to adorn them with delicate swathes of ivory tulle to protect them from the ravenous birds that snaffled last year’s crop. This year, I am determined we shall enjoy crisp fresh apples! Talking of monsters, the cutworms adore this time of year, getting their little translucent bodies ready for a feeding fest on my baby seedlings! So I’ve been pre-empting their evil ways by digging deep to find them before planting the beds. I hand-sift through the soil, picking them out with my fingers, and then crumble the soil just like making pastry. The soil is better for it, it just loves having the extra air manually input, being light and fluffy and friable. And the ants have woken from their winter slumber. They’ve got their eyes on our delicious fruit trees, and I’ve got my eye on them! I’m about to seal a few wounds with a can of tree sealing tar, and then I’ll paint a strip of jute with tanglefoot and tie it to the citrus tree trunks to stop them in their tracks. Let’s see who wins. This week I plan to sow multicolored carrots, turnips, chard, salad greens, more onions and a new crop of parsley and cilantro (coriander) as well as more flowers and two lemon verbena shrubs for soothing tea. I’ll wait a couple more weeks until I sow Malibu green beans, but I’m getting their bed ready now. On the harvesting front, tons of carrots are being harvested, the first fronds of new season tarragon, Spring artichokes, more ‘astro’ arugula, enormous beautiful leeks, amazing California avocados, buckets of lemons, sweet oro blanco grapefruit, Romanesco cauliflowers, curly and dinosaur kale, copious amounts of mint for tea, assorted herbs, and more bell and chile peppers (the peppers are little, but I can’t believe last year’s plants are still producing at all!). I know Chef Kurt’s particularly excited that the tarragon’s starting to emerge again, as he’s been making a delicious cauliflower and tarragon soup, basically just these two ingredients cooked with onions, coriander and turmeric, and then whizzed in the mighty Vitamix… yum! Also ready now, for the first time in this garden, we have two beds of cutting flowers, planted at Sue’s suggestion. She and husband Alex founded this garden and community together, and Sue’s eye for beauty is keen and detailed. 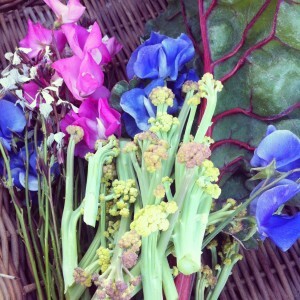 I’m so glad she thought of including cut flowers in our weekly harvest. And so I’ve been loving the Springtime display in Bed #2, and cutting blooms for vases around the property. From bulbs, there are daffodils, ranunculus, tulips, anemones, and freesia, and from seed there are sweetpeas and snapdragons. Also the established lavender bushes are going wild here, and the passionflowers I planted in December have turned into passionfruit and are set to take over the chicken coop! The baby onions are growing extremely fast, as are the garlic bulbs (the garlic greens are delicious finely chopped like chives), but the Brussels sprouts and green cabbages are growing so slowly it seems they’re hardly growing at all. I’ll feed them with more compost, more chicken poop and more seaweed this week and see if that gives them a boost. Talking of baby vegetables, I should also share the disappointing news that I lost every single seedling due to vermin eating them up or crazy strong winds blowing them away. Ugh! Our amazing carpenter, Cirino, is rising to the challenge by building a protective wooden wall by the outside seeding table, and adding more shade cloth to protect the little ones from the sun, which has been getting up to the 80′s some days! And then other days, it’s completely chilly all day, low 60′s. The wind is serious, and it took out fruit-bearing limbs from three citrus trees last week, which was very upsetting. Next year, we’ll make sure every fruiting bough is well staked and tied before the fruit swell. The wind and the temperatures are fluctuating like Spring should, but way more extremely than I’ve seen before, and without the rain. There’s been no rain this winter!! Two of the avocado trees are looking decidedly thirsty, so I’ve asked my assistant, Demitra, to deep water them by hand twice a week. Let’s see if we can turn around the brown edges of their leaves to glossy green beauties. In a few of weeks, night time temperatures should be above 55 degrees with any luck, and that means I’ll be able to plant the serious heat-loving summer stars like tomatoes, basil, bell peppers, summer and winter squash, melons and pumpkins. I hope to plant tomatoes and basil in the ground at the end of March, but I’ll wait until the soil is really warm until I put out the bell peppers and chiles. I’ve asked Larry if we can have more unusual heat-resistant seeds delivered from Seed Savers, including Malabar spinach and New Zealand spinach, both of which aren’t really spinach at all, but can be eaten raw as a tender salad green, or cooked just like spinach. But they differ from regular spinach in that they love serious August heat, and they’re also both incredibly ornamental, which is something I’m attracted to in this people-friendly garden. If you can eat something ugly, or eat something beautiful, I’d much rather grow the beautiful variety! I’ve also been tempted by some of the heirloom offerings from Franchi Seeds, as well as my staple sources, Seeds of Change and Johnny’s. 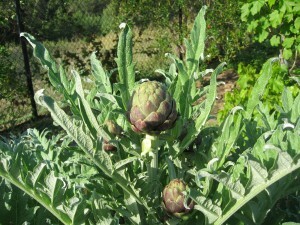 It’s the same reason: I love to grow unusual, heirloom varieties, it makes the garden more fun for guests. Yes, this is one of the busiest months in the garden – that’s why we turn the clocks forward, specifically in recognition that farmers and gardeners need that precious extra hour! And of course, regular tasks are happening whatever the weather, things like weeding, manicuring, mulching, composting, watering, soil blocking etc etc. “Soil blocking?” I hear you say… I’ll tell you more about that another time! But right now it’s all sow, sow, sow, prune and thin, prepare for heat, and make safe, for the winds are here now! Fragrant sweetpea flowers are one of the hallmarks of an English Spring garden, so I’m delighted they’re equally as happy to bloom in Malibu. I planted the little pea seeds around Halloween, and now have been rewarded with pink and blue flowers with a deliciously floral and deeply sweet scent. The tiny white stars are actually arugula flowers, which are not only as pretty as a country day, but are also edible. They can be pinched into separate little white flowers and mixed into a green salad for a wow-factor. They taste exactly like arugula, but are milder than the leaves. The big green leaves are ruby Swiss chard, which is a sturdy deep green vegetable that’s great in soups and stir fries, but can also be eaten in salads, and the little spears are in fact Romanesco cauliflower fronds. Romanesco cauliflower is probably my favourite vegetable in terms of appearance, with its precisely symmetrical Fibonacci spirals. If the heads are left slightly longer, they sprout into broccoli-style florets, because Romanesco cauliflower is in fact considered a type of broccoli in Italy, which is where it’s from. Not shown in this picture are the Spring carrots and leeks which I also just pulled, but they’re luscious and gently flavored for this sweet, baby vegetable time of year. I’m going to finely chop, shred and dice everything and serve it with a garlic vinaigrette for a delectable and nutritious supper tonight. If you have even the smallest window ledge, now’s the perfect time to plant some seeds for your own future supper. Nothing like FRESH vegetables, and a 12″ x 12″ pot can easily grown a super fresh salad for two. Just fill with great organic soil and sprinkle mixed lettuce seeds on the top, about 1″ apart. Water and watch, and soon there will be baby greens ready for you to snip!